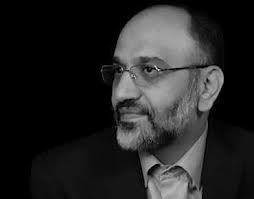 Kaleme, translated by Persian Banoo: Dr. Mehdi Khazali was re-arrested on October 30, 2012 in a raid of the Pen Society meeting. Dr. Khazali, an Ophthalmologist, author and regime critic, has been arrested six times before. On his last arrest he launched a hunger strike that lasted more than seventy days. What is the latest news from your father? We have no news from him since his arrest, other than a few of his friends who had been arrested and saw him in Evin. My father told them he is in the basement of Ward 209 and has launched a dry hunger strike. We have no other news from him since. He has not called us and last Thursday they would not allow us to visit him. Have you followed up with the Judiciary officials and have they given you any response? The Magistrate’s office in Evin is not a place to get any information. We did go to the Magistrate’s office in Evin but they told us they have nothing to say to us. No one is giving us any answer. And do you think that Mr. Khazali will remain on a hunger strike just as he did in previous times? Yes, he will continue his hunger strike until such time that he is either released or……Last time Mr. Hashemi urged him to halt his hunger strike. But now there is no way for us to communicate with him to ask him to halt his hunger strike. We don’t know anything about his situation, we don’t know if he is well or not, we don’t know if he is receiving medical attention, we don’t know anything. Last time Mr. Khazali’s mother pursued his case, and according to Mr. Khazali, it was effective. Is his family (his mother) doing the same this time? As far as I know they have not. Only that my grandmother has made a phone call and they told her, “Mr. Mehdi is doing fine and he is not on a hunger strike and we checked on him everyday”. Do you mean they gave you false information? In previous times they did the same thing. They would call and tell us he is not on a hunger strike. Last time they told my grandmother that news of him being on a hunger strike is false. But according to his medical records there and his day by day weight loss, it was apparent that he was on a hunger strike. They are saying the same thing this time, that he is in good condition, is not on a hunger strike and that they check on him. But my dad has not called us, and knowing my dad, he is on a hunger strike. If there is even one percent chance that he is not on a hunger strike, as worried as we are, why don’t they allow him to contact us and tell us he is not on a hunger strike. We feel that, when they don’t allow him to contact us, then he must be in a poor condition, and that’s the reason for them not allowing him to call us. So we won’t hear this news. Do you have any news about the rest of the people who were arrested that night? There were about 80 people arrested that night. All except 17-18 of them have since been released. Afshin Ghorbaninejad, Mohamad Parsi, Mohamad Bagher Moradi, Hamidreza Soalimani were released on Eid Ghadir. Akbar Amini, Pezhman Zafarmand, Mehdi Karimi, Majid Saeed Arab, Hojatollah Nakhostin and Javad Amoli…I don’t have the presence of mind right now; I cant remember. From the 80 or so people they arrested that night, they detained these 17-18 people. They transferred them to Evin the next day on Wednesday and then to the Court in Evin. I have heard that they initially issued temporary detention orders, then set bail for them. In any case, they did set bail for them, like 20 million for one detainee and 30 million for another. They told them to call their families from Evin and tell them to go post bail on Sunday. They told some of them to tell their families to go there on Thursday to post bail. On Thursday families waited at Evin from 8 to 11 in the morning, but a Judge never showed up at the Evin Court. The guards kept asking people to wait. I myself also went there but didn’t see a Judge there. Apparently the Evin Court is closed on Thursdays. That afternoon they told everyone to leave and come back on Sunday. On Sunday when families attempted to post bail the Judge told them, “I told you to bring bail but didn’t tell you when”. At first they didn’t allow anyone to go inside. My mother was also there, but she was not allowed to enter either. My mother pleaded with them and told them how very worried we all are, and that we have no news from my dad. But they didn’t answer her at all, they didn’t give any answer to the others either, and no one has yet been released. Since few days ago, they have started conducting searches of the homes of some of the detainees. They searched Mohamad Parsi’s home taking him there with them. They have also conducted search of Mohamad Bagher Moradi’s home. These are the two that I know of. They confiscated their personal items and computers. One of them said he is in a cell in Ward 209 with 4-5 other people. Have they interrogated him (His father)? Considering that they will most probably read your interview with Kalameh, do you have anything to say to them? Please allow us to visit my dad, let him call us, or at least give us some news about him. We are very worried. There was no reason for his re-arrest and he had previously been released by the order of the Supreme Leader. I don’t know if the Leader is aware of this matter, but we are trying to inform him of this latest arrest. End of interview with Kalameh. Dr. Mehdi Khazali’s son, in an interview with the Melli-Mazhabi site, told them that on the 8th day of his arrest, they know he was on a hunger strike, but have not had any more news from him since. He said, “We went to Evin twice trying to find some information about him. The first time they said he in not in Evin, and the second time they said he is there and is doing fine. He is denied phone calls, denied visits, denied everything. They told us he is being interrogated, but the last time he was incarcerated they allowed him to contact us while undergoing interrogations. This is not a reason for them not to allow him to call us. One of the people that was detained in Evin told us that, as of the 8th day of incarceration, he was on a hunger strike and not in a good condition. Support Mehdi Khazali NOW, don't wait for "Regime change." serious concern about the health and well being of Dr. Mehdi Khazali who has been unjustly incarcerrated AGAIN, because of his independent views and social activism. He is the son of Ayatollah Abolghasem Khazali, one of the authors of the Regime's constitution. He was a frequent guest on VoA Ofogh program defending the reformist agenda. On the program, he foresaw his arrest and the subsequent hunger strike. His arrest and the treatment of the other Regime pillars like Nourizad show that the Regime is in very bad shape and is trying to quash any alternatives from within. Regime change by Iranians for Iranians with logistical help from the sane world is the only way to end this 34 year nightmare. Messianic Islamist Rapists, “reformers” and all will continue violating the most basic human rights of Iranians to the last moment that they’re in power. Backbreaking airtight sanctions plus air/naval quarantine is a must!